activities. By the end of the war, he had risen to the rank of major. University’s School of Advanced International Studies in Washington. Warfare , still regarded as the most authoritative text in the field. Linebarger was reared in a High Church Episcopalian family. 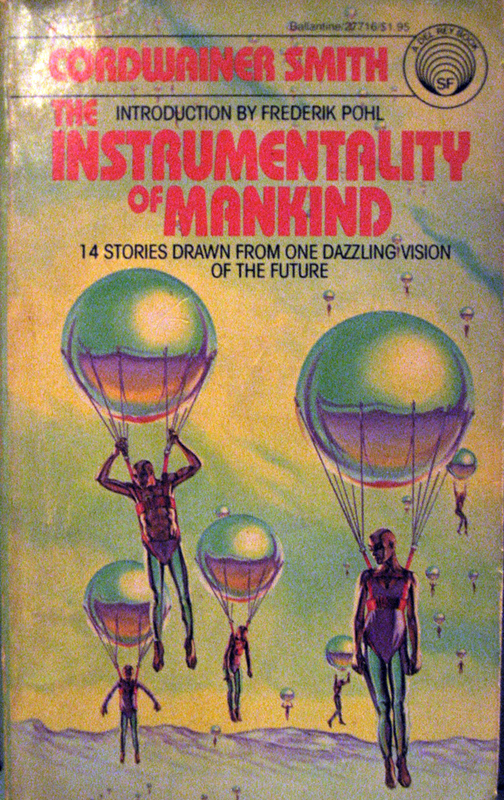 Alan C.
fiction he published as Cordwainer Smith. Psychological Warfare (1948; rev. 1954; reprint 1972). ways to settle differences than killing people. fiction, Linebarger matches the use of words with acts of kindness. as they meet and interact with each other. copy, you can obtain it though inter-library loan. and ritual in his stories. tells her little girl the saga of Helen America and Mr. Grey-no-more. well- known paintings of the events. that his writing is, in part at least, for “fun”. attention to one of the most striking. and sometimes suffering permanent damage as a result. A society that thinks it has all the answers is an autonomous society. event, humanity is pushed away from autonomy. who celebrates the sacrament: He is the “instrumentality” of God. strongly enough, are seriously crippled or even die. intercession of an unexpected visitor saves his life. is primate of the Old Strong Religion. Crucified God from a woman named T’Ruth. Christian hero sets out on his journey to a new Eden. Briefly in conclusion let me comment on the influence of these stories. though sometimes the editors removed the explicitly religious parts. Linebarger for yourself, I count this essay a success. I. Larger studies of “Cordwainer Smith”. pages; $2.50. Collection of short essays and reminiscences. term, etc. in the Smith corpus, with translations and interpretations. Cordwainer Smith ( Speculation No. 33; photocopy obtainable from Mr.
Peter Weston, 72 Beeches Dr., Erdington, Birmingham, B24 ODT, England). however, this is a helpful essay. early collection; its stories are contained in other later collections. Lords of the Instrumentality” (p. 227). wrote this story in one afternoon. resurrection and end the ceremonial law imposed by the Scanners. Notes 1. “Cordwainer Smith ” The Shaper of Myths”, in The Best of Cordwainer Smith (New York: Ballantine, 1975), p. xii. 2. Pierce, “Mr. Forest of Incandescent Bliss”, in Speculation 33, p. 7. 3. “Shaper of Myths”, p. xiif. 5. Arthur Burns, “Paul Linebarger”, in Exploring Cordwainer Smith (New York: Algol Press, 1975), p. 9. 6. Ibid ., p. 9f. 7. Ibid ., p. 9. 11. D’Alma in “On the Sand Planet”. 12. E’Telikeli in Norstilia . 13. Interviews were conducted by Rev. George Grant, and his findings communicated to me in a conversation.